Adopt key insights and ideas into the core skills of strategic thinking. The complexities of the global marketplace are challenging traditional management approaches to change. In this environment, organizations are judged on the quality of their ideas and how quickly these ideas can be translated into action. To do this effectively, we must transition our focus from being operationally focused to thinking strategically. 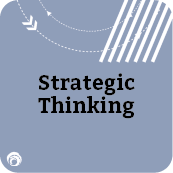 Strategic Thinking is the ability to balance critical thinking with strategic insights in order to resolve business challenges or uncover new opportunities. It is truly an essential skill for success—and a proven way to distinguish yourself and your contribution to the organization. Utilizing models, application and skill practice activities, this interactive session will help you adopt a strategic mindset when contemplating business issues or opportunities, and when interacting with colleagues and customers. Focus your efforts and make better decisions with greater confidence. Add value to your organization by understanding the needs and expectations of your organization, your boss and clients as well as the potential demands of current and future trends. Identify strategic opportunities, and engage and influence key stakeholders. Learn to sense problems and opportunities, identify key issues, and find paths that will move you toward the desired future. Encourage and support innovation to generate new ideas and meet emerging business needs.